Summary: Fuchsia plant care can be done by anyone, it is even possible to take an upright growing fuchsia and force the branches down to make beautiful plants and hanging baskets. A wide array of colors and vigorous growers make the fuchsia an excellent potted flowering plant for the patio. The Fuchsia plant family sees many new introductions every year – into the 100’s. Not many plant families can boast of as large a family as this. Fuchsias (Gartenmeister Bonstedt), or Ladies’ Eardrops, as they have often been called, were first introduced into Great Britain from Chile about 1788. At the height of their early popularity less than a hundred years later, there were 541 known species and varieties; today we have thousands of species and cultivars available online or at garden centers. In the 1800’s, a nurseryman in England was walking down the street in his neighborhood and saw sitting on a window shelf a flower he had not seen before. He asked the lady of the house and she informed him that a sailor had brought her the Fuchsia plant and she thought that it had come from somewhere around South America. The nurseryman asked permission to take the Fuchsia with him for propagation in exchange for half of the plants. This was a very profitable transaction. This original introduction Fuchsia magellanica, is one of the parents of our fuchsias of today. Years later, there were others found in South America, off the islands of South America, and Mexico. These hardy varieties of Fuchsia all had very small flowers and were very graceful. 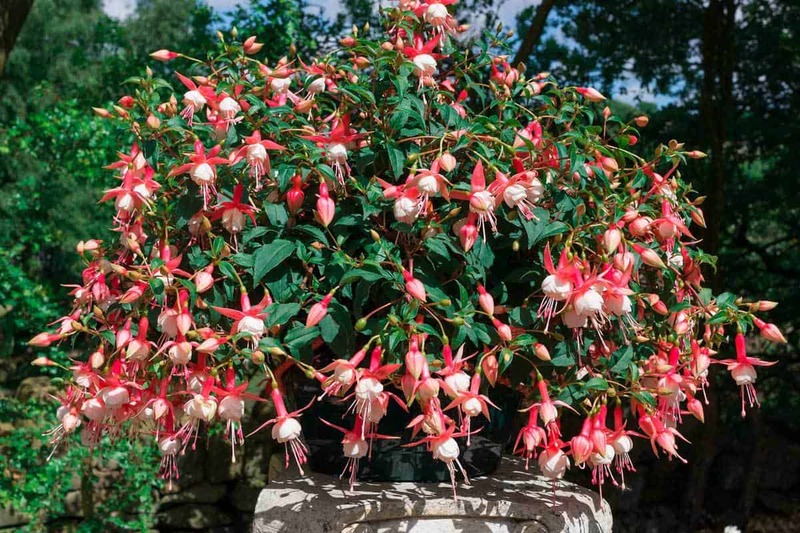 The years have brought many improvements on the original fuchsia plant and it is doubtful if the ancestors of our beautiful fuchsia of today would recognize their offspring. Our fuchsias of today still carry the original grace but the beautiful blooms are much larger and in showy colors. Lest some of you think I am indulging in slang when I suggest Fuchsias are real Cool!, let me assure you… I mean it literally; if they aren’t cool – they’re dead. So if you want these fabulous beauties in your window garden, first be sure you can supply the very cool conditions they require through fall and winter. Fuchsia “Chillerton Beauty” is a free-flowering upright hardy Fuchsia found in Oregon and Washington. This tropical and tender perennial grows in USDA hardiness zones 8-11. Honeysuckle fuchsia also grows in USDA Hardiness zones 9-11. This species requires protection for long spells of temperature under 32° degrees Fahrenheit. Zauschneria or California fuchsia is another evergreen shrub under the Onagraceae family. It loves well-drained soils in full sun and attracts many hummingbirds. Its funnel-shaped scarlet flowers bloom during late summer and fall. Fuchsias have discouraged more indoor gardeners than any other plant with the possible exception of those wondering how to grow gardenias, yet they are the “growingest” plants I have ever had. So if you can keep them cool, here are a few tips to help you the rest of the way. And if you just don’t have a cool spot in your home, porch, patio or breezeway, you might as well quit reading this article right now, because nothing I’ve got to say can help you. Fuchsias are very easy plants to grow and are very good pot subjects. In Southern California, the home of fuchsias, they are grown in gardens in locations with partial shade. Many grow into massive trees 8 and 10 feet high. The weaker-stemmed, low-growing types are ideal for trailing from hanging baskets, and in my opinion, display their blossoms to better advantage than the upright plants. The long tube terminates in four reflexed or spreading lobes, exposing the petals (four, five, or more), with the stamens and stigma extending out from these. Fuchsias are very fast growers and start to bloom when very young. By pruning, fuchsias can easily be kept within bounds and make very beautiful pot specimens. There are the upright growers which should be staked or trellised. The hanging basket type for hanging pots or hanging baskets or for window boxes or pots for window shelves. Bush Fuchias are beautifil but a favorite form for many is a Fuchsia standard grown as a tree with the sideshoots removed. When planting or potting Fuchsias remember they like soil slightly on the acid side and a soil with good drainage. Fuchsias are heavy feeders and should be fed every month, a good commercial slow-release fertilizer or a general purpose liquid fertilizer is good. A dressing of cow manure is very beneficial. Feedings will give you a plant loaded with beautiful flowers. In addition to being heavy eaters, fuchsias are also thirsty plants. Fuchsias should be kept damp at all times. They like lots of water BUT be sure there is good drainage. These are plants that like humidity and this can be brought about by spraying the leaves with a fine mist of water. On bright days, fuchsias enjoy being syringed with tepid water. Spray with water at least twice a week. In the hot summer period a spraying every day will be very beneficial. The heat draws moisture from the foliage of your plants and fuchsias will not tolerate this. By spraying you can build up the humidity and keep your plants in good growing condition and have a continuous wealth of bloom. Remember, in watering with a spray you are not watering the root ball sufficiently. You must water your soil in the pot. Many times, people feel that water on the surface of the soil of a pot plant is all that is needed. This is doing your potted plants a great injustice. You must soak your soil when watering. It is best to water less often and do a thorough job than to skim over them once in a while. Water must penetrate into the soil surface so that all the roots will have water. Roots must be kept in good condition if you are going to have good plants with nice flowers. What Pests Like Fuchsia Plants? When watering, I use quite a forcible spray in order to jar loose any insects that might be trying to get a foothold. Fuchsias are a favorite of all the more pesky pests, such as whitefly, fuchsia gall mites, and red spider mite. Slugs also fed on the new growths. Aphids like to feed on Fuchsias. Prevent these insect pests and kill aphids by spraying your Fuchsia Trees and plants with sprays of organic neem oil or horticultural oil) once every ten days. Pruning your fuchsias is important if you want a nice shaped plant. Upon planting a young plant, after it has formed four or six sets of leaves, pinch out the top of the plant. From each leaf axis a stem will grow. This will later be a branch. After these branches put out four or six sets of leaves, pinch out the center of each of these. This will produce a nice bushy plant. The hanging basket Fuchsia varieties need still more pinching. Follow this pinching process until you have a nice bushy plant before you let the branches hang. Failing to get a bushy plant before you let the laterals hang will give you an unsightly stringy plant. In the fall or early spring, prune your fuchsias. Upright growers are best cut back to about 8 or 10 inches from the ground. This gives you the main stem of new healthy wood and keeps your plant in bounds. Your new wood is the flowering wood, and you will have more flowers by pruning in this way. On the hanging basket varieties, cut them back level with the bottom of your container. You may have to shift your plant to a larger pot, and the best time to do this is after you prune your plant. Fuchsia Care – Where Do They Grow Best? Fuchsias are shade loving plants, but there are some varieties that will grow out in the sun. Your orange and red varieties will stand more sun than the pastels or double varieties. They do much better in semi-shade, however, or early morning sun. These plants grown in the sun require close watching and much watering, especially spraying. Each fuchsia type is beautiful and they all have their own special merits. You will find the singles bloom much more abundantly. Fuchsias come in almost every color with new flower color combos being released every season. Fuchsias need coolness above all else. They prefer that temperatures never go over 65° degrees Fahrenheit but they can stand higher ones providing the humidity is high, too. I once had a plant that inadvertently got set outdoors in early spring and was forgotten until it burst into full bloom. As an experiment, I left it where it was all summer, and despite almost full sunlight and hot days, it did remarkably well. Mostly, I think, because the nights were cool and dewy, and during the daytime, I showered it with the hose every time I got near it. However, best culture requires that the plants be protected from hot sunlight. A nice way to grow basket fuchsias is to plant them in a wire hanging basket. Line your basket with sphagnum moss, put in your potting soil and plant your fuchsia in this. Hang your basket and work the roots of Baby Tears Moss under the wires and into the sphagnum moss. The Baby Tears will soon take hold and spread over your basket and you will have a beautiful green basket. This moss is evergreen and it will help retain moisture in your basket and keep the root ball of your Fuchsia damp. When starting the moss be sure to spray it with water every day so the roots will not become dry. The beautiful effect you will get will be worth your time and efforts. There are many good outstanding varieties, with all the shades along with single and double flowers, in baskets or upright there are many effects blooming fuchsia plants will give. If you have your heart set on a certain standard variety (upright or tree form) and long for a hanging basket plant of this variety, you can have it with a little patience and work. I love to experiment with these and have had very good results. Let your branches start growing. Get some large nails, in several weights. Loop this cloth over your branch. You must have fairly large, strong branches. Start with lighter nails and in a week replace with heavier nails. Sometimes you’ll need to put multiple nail sets on one branch. These weights will encourage the branches to grow down and soon you can remove the nails. You can grow some beautiful specimen plants in this manner. Never use string, as this will cut into your branches. Another nice way to grow upright fuchsias is to put a trellis in your pot. A six-inch pot will hold a three-foot trellis very nicely. Have your trellis in a fan shape and as your branches grow, tie them in place with twist-ems or narrow pieces of cloth. As the foliage fills out the pieces you tie with will soon be covered and will not be seen. These make beautiful specimen plants. When you start small plants never over pot them. Keep shifting to the next size pot as it is needed. Your plants will grow faster and have a much better root system grown this way. I get a good bushy basket plant in a four or five-inch pot before planting it in my basket. Remember to pinch your young plants, feed them good, water them well, give their foliage a bath and spray with a good insecticide and you can grow fuchsias that are outstanding. When growing tree type fuchsias don’t start with large, well-established plants if you want them to adjust to your indoor and outdoor conditions and be amenable to training. Like the hanging basket varieties. Shift the plants to larger pots as necessary, using pots two inches larger each shift. Pot in a soil composed of peat moss, perlite, potting soil, and coarse sand. How do you care for fuschia plants in winter? Fuchsia plants make beautiful additions to any garden or home. They also give the added benefit of feeding some small birds like hummingbirds throughout the summer. Unfortunately, these plants simply are not built to stand through the winter. So how should owners of fuchsia plants properly prepare them for the cold of winter? To keep your old plants through the winter, place them in a very cold but frost-free spot. From October through December give them only enough water to keep the wood from shriveling. Next step – take them out of the pots, wash all the soil from the roots, and repot in the same size pot using fresh soil. Increase the amount of water given as the plants require it, pinch two or three times before the end of May, and either shift to larger pots when necessary or begin supplemental liquid feeding when roots have filled the soil. When the plants finally become established in the pot size you want them to flower in, use a liquid plant food in place of every third watering, fuchsias are heavy feeders, and soon spindle out unattractively unless kept well fed. Plants may also be started from seed in January or February if you have facilities for seed-starting. The best cuttings are from suckers which spring up from the base of the plants, and should be about three inches long. Add more sand to the potting mix to start them in, give them shade, a temperature no less than 60 degrees, and spray them lightly if they show signs of wilting. If you provide your plants with ample root-room in rich, rough soil, feed and water them liberally, and keep them as cool as possible, your fuchsias will live for years and years, increasing all the time in – beauty as well as size. As you learn to grow them successfully, you’ll want to have more and more of them.